When you think of the future of marketing, what comes to mind? Each day, the battle to be heard and seen online becomes more competitive and more expensive. Each day, your clients are inundated with more and more junk email that they will never read, and they may never even know that they are missing out on what you have to offer! 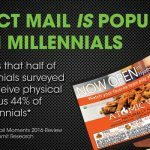 Fortunately, at Spectrum Marketing Companies we have numerous ways in which Direct Mail can be employed to lift your business above the fray so that when your piece arrives in the mail, it is only the beginning. Simply asking people to go to your website is ineffective unless there is a compelling reason for doing so. Offer them a free trial or sample. Advertise a complimentary seminar. Herald a grand opening with savings coupons. There should be a clear call to action. Consider promoting a sense of urgency with a limited window of opportunity. It’s marketing 101: people respond more readily when they have a limited window to act before an opportunity will pass them by. Think of your direct mail as an appetizer, and give your clients a taste of what you can do for them! A plastic gift card is an excellent way to add curiosity-inspiring “bulk” to your mail piece. Oh, and it happens to be a phenomenal vehicle for your offer. Non-retailers, such as hospitals or educational institutions can easily replicate the effect with a magnet or other interesting feature that recipients will want to retain. This creates the feeling that your marketing efforts are pointedly focused on specific consumers. Address them by name! We can customize each piece to specifically address each customer on your mailing list, swap out fundraising donation values depending on your customer’s financial status, and even change coupon offers from one customer to the next to target each consumer. Build excitement with a match-and-win prize number or a scratch off. Adding the anticipation of unveiling additional prizes or deeper discounts for your promotion is an irresistible way to have your potential customers spend more time reviewing your offers. A match-and-win giveaway that offers an attainable prize (think $2,500 shopping spree – not a yacht), adds stopping power, elicits interest and makes the trip to your location well worth the drive. Not to mention, when someone wins, you’ll build good will, get credit for the sale of the prize, and have a story to tell that your Facebook followers will actually read. Spectrum can coordinate prize insurance for only 7% of the retail value of the prize! Die cuts add originality and functionality. Clever design, unique shapes and perforations help you capture attention, stand out from your competition and increase the ease of response. Physical advertisements, like direct mail, are proven to have more influence than other forms of advertising, cause recipients to spend more time with your message (and remember it) and elicit a stronger emotional response. Direct Mail, coupled with your other marketing efforts can create a cohesive, yet diverse array of tools to drive your business.